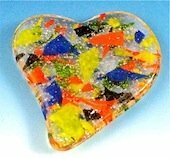 A fused cast glass confetti bubble pendant, made from three layers of glass. 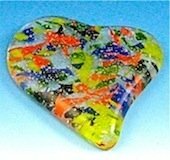 The combination of medium frit and confetti inclusions will produce many bubbles during the glass fusing process. Do not use fine frit as it will produce too many bubbles and make the finished item appear cloudy. The finished heart will be 1 3/4 inches wide by 2 inches long. The mold is from Delphi and is originally supplied with a post in the left hand corner to produce a mounting hole. Unfortunately, this style of mold can result in the fused glass sticking to the post and ruining the mold. Before use, the post can be removed by using a craft knife to cut down the sides of the post until it is thin enough to remove. The bottom can then be smoothed over by sanding. Bullseye glass is used for this project. Step 1. Apply about five coats of kiln wash to fusing mold. Allow to dry between coats. Step 2.After drying, place a thin layer of frit in bottom. Do not scratch through kiln wash as glass will stick to mold. Step 3. Break up some different colored confetti pieces and scatter across the frit. These pieces can be about a quarter inch wide. The side photo is a rear view of a finished pendant showing the size of the first confetti layer. Step 4. Apply another thin layer of frit over the confetti. Step 5. Break the confetti into small shards and scatter over the frit layer. The pieces need to be thinner and smaller than the first layer as this will allow the bottom confetti layer to be seen. Step 6. Add another frit layer, build up slightly towards the center to help counter shrinkage. Shrinkage occurs because the material tends to compact downwards and may end up two thirds of its original thickness. Do not overload with frit as the fused pendant will be too heavy. Using a small brush go around the edge of the fritand create a small channel between the frit and the mold. This is done to minimize spiking. 280° F (140° C) up to 1360° F (738° C) hold 15 minutes. 300° F (150° C) up to 1470° F (800°C) hold 15 minutes. Ensure that top of casting is smooth. If not it may need to be held longer. AFAP down to 900° F (482° C) hold for 60 minutes. Switch off kiln and cool to room temperature. Check pendant for spikes as cast glass can quite often have spikes around the upper edge. If any spikes are present remove with grinder or abrasive pad. Clean completely and place in kiln, fire polish to remove abrasive marks. Do not place back in mold as the marks may not be removed if they are covered by the mold. Use prepared kiln shelf for this process, monitor closely as the pendant will spread if the is is over heated. The piece is designed to hang from the left hand corner. A pendant bail can be used or a hole can be drilled to accept a jump ring.